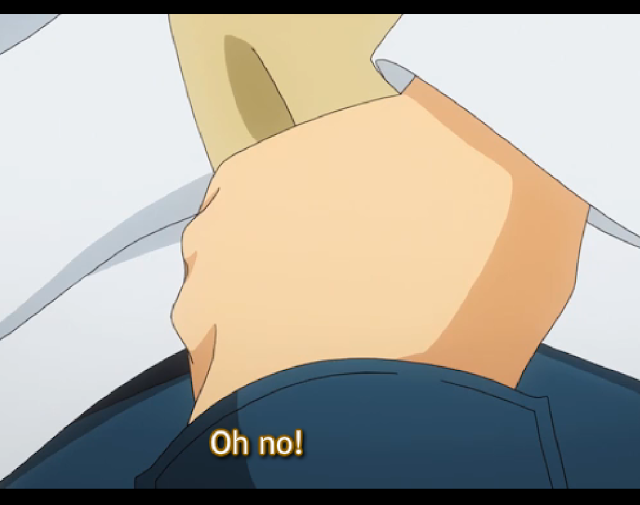 I Blog Anime: Golden Time: Serves me right. This. This, is what I get for being excited about having read the manga first. My hopes dashed upon the rocks before they even had a chance to flail their wings about, let alone soar. You need to understand, that I'm a cynical, pessimistic kinda guy. I take little signs of potential flaws very seriously. I look for excuses to shoot my hopes down to earth. Now, rather than reassuring me of the excellence that this anime will be, the manga has me doubting every little design choice of the animation studio. 'Are they doing this on purpose? Because they had to? Because the original wouldn't work? Will they make this the foundation of some terrible half-arsed quick end? ', these questions are going through my head non-stop. How the hell do other people that have read mangas before they got animated stand it? It's working its hardest to try and depress me. I was wondering just what they planned to do with the anime when the manga, to the best of my knowledge, hasn't even completed yet. Maybe just run a short season anime, that doesn't move through all of the existing content. Now, I'm not so sure. I'm not saying that this anime is going to be bad. Hell no, quite the opposite I still hope many things of this one, and I'm willing to wager a solid bet that those of you who like Drama/Romance/Slice of Life will enjoy it. I'm just lamenting that my foreknowledge has poisoned my maximum potential to enjoy the anime. [Spoiler Warning]In the manga, this little bit of scrunched up paper he's shoving into his back pocket was burned on the spot instead. This isn't something that needed to be done, it would have added to the drama. As soon as I noticed this too, I also noticed that the last two or three scenes before this also felt a bit off, and I suddenly remembered that it went differently. Those scenes, fine, nothing suspicious, maybe they just wanted to turn up the suspense a bit. Not burning these papers? 100% stinks of 'We plan to use this later'. When the animation studio plans to use something that wasn't in the original story, things start to unravel, just as badly as when things that existed are removed. Yay me! *High fives self in the mirror*. For the first time, I feel like I've actually just slapped out my feelings about something into the blog, and not written a goddem essay.